Spend $100 and get a $20 Gift Card. 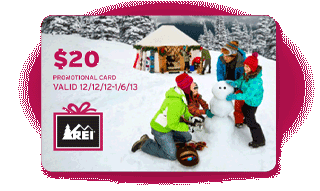 Offer ends 12/9/12 and is good at REI.com, REI stores and REI-OUTLET.com. Promotional gift card can be redeemed 12/12/12–1/6/13. Exclusions apply. More details.